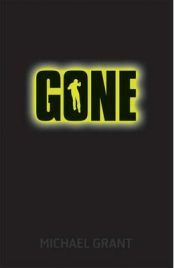 Gone by Michael Grant is the first novel in a series which, like many book series, is named after its first novel. It is a young adult novel, something I wasn’t actually aware of before I read it – although I do read quite a bit of young adult fiction. One day, in a Californian town called Perdido Beach, everyone aged fifteen and over disappears. There is no warning – they just vanish into thin air. Cars crash, homes are left empty, TV and phones stop working. And the only ones left are those under fourteen. Sam Temple and his friends Quinn and Astrid try to figure out what is happening as they go in search of Astrid’s autistic brother Little Pete. They discover that the town and its surrounding area are enclosed by an impenetrable wall, and that some of the kids, Sam included, have developed strange powers. The area is soon known as the FAYZ, or Fallout Alley Youth Zone – after the town’s nuclear power heritage. It becomes a war zone as the town kids and pupils from Coates Academy, a private school for problem kids, clash over territory and power. But Sam has more than just the kids war worrying him – his fifteenth birthday is fast approaching. The action of Gone gets started immediately, and you are thrown straight into the new and confusing world that the kids live in. There is plenty of action as the story gets going, and it is fast-paced and exciting. As well as Sam, we also follow the stories of Caine, the leader of the kids from Coates, and Lana, who is badly injured when her grandfather’s truck crashes after he disappears. We learn from all three as they try to get to grips with their new world, and see different aspects of the changes from each one. Sam is the main character, the one you want to cheer on and you want to be the strong person you know he can be. Caine is the bad guy, who of course is written in such a way as to be compelling but also completely loathed. And Lana is on the edge of the story for a long time, stuck in the desert with her loyal dog Patrick, but she becomes caught up in dangerous things which Sam and Caine have no idea about, and so you find yourself cheering her on as much as Sam. Sam and his friends show concern for babies and small children who have been left alone by the disappearance of their parents, and this for me was the first impact of the novel. I was upset about all those tiny children left helpless and with no one to look after them. Sam and the others realize they cannot help everyone though – something I don’t think I could have written. I would have had them running around town, finding all the babies, and then getting on with the action of the novel. There is however one character called Mary who takes over the town daycare, and ensures the safety and care of the children there. One scene when Sam and some others have been assigned to search some empty houses is very upsetting; perhaps you can guess why. This scene, more than any other, shows that although Gone is a young adult novel, Michael Grant does not shy away from the more upsetting aspects of the scenario he has created, because of course, were something like the FAYZ to actually happen, such things would be the reality of life there. As I mentioned previously, before I started reading Gone, I wasn’t aware that it was a young adult novel. However, I began to suspect it was from the style of writing. It is something which is very hard to put your finger on, but the dialogue and narrative definitely have that style which is characteristic of young adult fiction – and I don’t mean using teen slang/language, which thankfully isn’t something Grant does very much of at all. Yet due to the lack of slang, this is a young adult novel which could have a much wider appeal – it has an interesting concept, a well-written and exciting story. Gone is a thoroughly enjoyable read, one which I couldn’t put down and read a lot faster than I had hoped to. I’ll be continuing with the series as soon as possible, and would recommend Gone to readers of all ages.